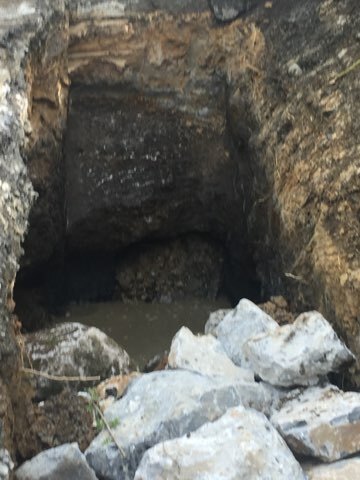 Work has begun on a road at Gurteen, Castlecomer, which was damaged when a large portion subsided into an old mine shaft, last month. On Thursday, following survey work, Kilkenny County Council began the extensive work on repairing the road. County council engineers informed local Cllr Pat Fitzpatrick that re-filling the damaged road will take four separate layers of rock before tarring and chipping. Following settling and testing it is hoped to have the work completed and the road re-opened by the end of next week. Cllr Fitzpatrick expressed his thanks to the Kilkenny County Council engineers for their work on the project and he thanked local community for their cooperation and patience while the survey and repair work is completed. Cllr Maurice Shortall added: "The geophysical survey covered an area some 150 metres on both sides which has alleviated the concern of nearby residents." Cllr. Shortall says all are relieved to get back to normal traffic. "The road network in this remote part of North East Kilkenny is very narrow and sections like Lady's Lane had been used as a short cut during diversions. Great credit to our Municipal Engineer and staff for expediting the works and thereby ensuring safety first for all who use the road." said Cllr. Shortall. There have been traffic diversions in the area since the subsidence was discovered, in late February.